What are the O range Hefty Energy Bags? Hefty Energy Bag is a unique program designed to convert previously non-recycled plastics into energy. Plastics collected through the program will be sorted at a local recycling facility and converted into energy used in cement production. 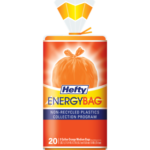 What items can be placed in the Orange Hefty Energy Bags? Juice pouches, snack bags, microwavable pouches, cake mix liners, cereal box liners, laundry pouches, potato chip bags, frozen vegetable and fruit bags, squeezable pouches, form “to-go” boxes, foam cups, salad bags, plastic cups, plates, bowls and serving ware, dog and cat food bags, candy wrappers, pudding cups, straws and stirrers, and all other non-recycled bags. Where can I buy the Orange Hefty Energy Bags? You can now purchase these bags through Papillion Sanitation. Each roll comes with 20 bags and each roll is $10.00. We will even deliver them to you on your trash day. If you need some of these energy bags, please call our customer service at 402-346-7800 and your customer service representative will help you.